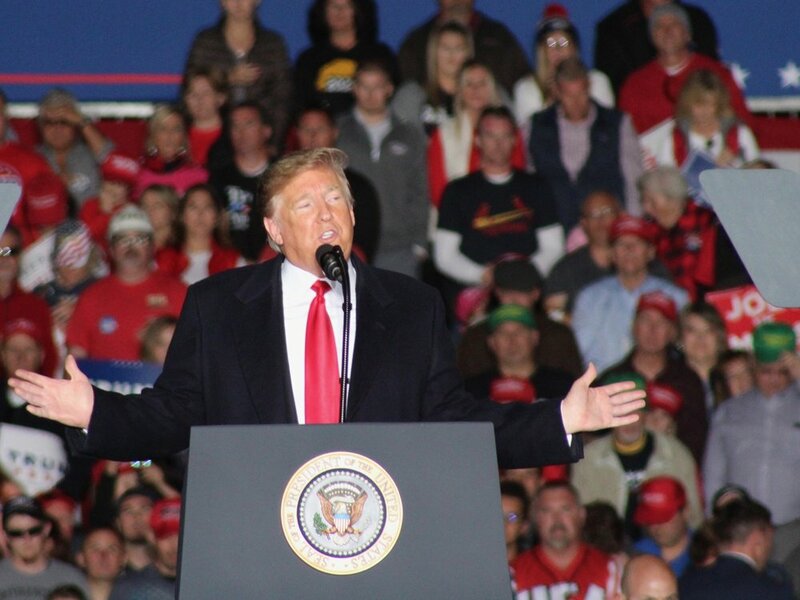 President Trump was engaging and comical in playing to a partisan Republican crowd of thousands at Southern Illinois Airport last weekend, but he also slipped in more than a few whoppers in his hourlong speech. After opening with a surprisingly strong denunciation of anti-Semitism in the wake of the mass shooting at a Pittsburgh synagogue earlier Saturday, Trump quickly shifted into campaign mode and peppered his address with lies on key hot-button issues. Trump said his main reason for coming to Murphysboro was to back the town’s favorite son, Congressman Mike Bost. But first there was the reason he decided to make the trip after that anti-Semitic hate crime of domestic terrorism. Trump said he considered canceling the trip out of respect for those killed and injured in the attack, but cited how the New York Stock Exchange and the New York Yankees resumed activities immediately after the Sept. 11, 2001, terror attack. Wrong. The NYSE was closed until the following week, Sept. 17, and the Yankees resumed play the day after that — in Chicago at White Sox Park. New York didn’t play host to a major sporting event until the Mets returned home later that week. Trump and Bost both insisted that, if Kelly were elected in a Democratic wave to win a majority in the U.S. House of Representatives, he’d vote to elect Nancy Pelosi speaker. Putting aside the dog whistle of inciting the electorate against a strong woman, Kelly has repeatedly refused to support Pelosi. Bost claimed to have passed a $2,200 tax cut for the average family in the 12th District. According to the Institute on Taxation and Economic Policy, the savings for a middle-class family in Illinois making between $49,000 and $79,000 a year would be less than $1,000. Kelly has pointed out that would soon expire, while the larger tax cut for the wealthiest citizens and corporations would continue. In the meantime, the $1 trillion deficit that tax cut has caused in the federal budget has Republican leaders in Congress calling for cuts to Social Security and Medicare. Both Trump and Bost said they would protect those with pre-existing conditions in health care, but Bost voted 14 times to repeal the Affordable Care Act, with its demand to protect those with pre-existing conditions. “We defend our constitution,” Trump said. Members of the media, however, have called into question his commitment to the First Amendment and the free press, which he repeatedly calls “fake news” and “the enemy of the people,” although he refrained from using either of those terms in Illinois on Saturday. And on Tuesday Axios reported Trump is considering an executive order to end birthright citizenship, the longstanding policy that makes anyone born in the United States a U.S. citizen, enshrined in the 14th Amendment ratified in the years following the Civil War. Trump said, “We’re putting our coal miners back to work. Clean coal … beautiful, clean coal.” But the Sierra Club’s Beyond Coal campaign has insisted, “No part of coal’s lifecycle is clean,” emphasizing the damage done by coal’s waste products. Trump insisted he was working to lower drug prices, but neglected to mention that the new U.S.-Mexico-Canada trade pact he just negotiated put restrictions on Canadian generic drugs, which is likely to drive prices higher. “We will protect your right to free speech and religious liberty,” Trump said, but his attacks on the media and his Muslim travel ban argue otherwise. Trump was there to boost not only Bost in his re-election, but Congressmen Randy Hultgren and Rodney Davis, both involved in tight races against Lauren Underwood and Betsy Dirksen Londrigran, respectively, both of whom have made Obamacare — and the Republicans’ vote against it — a key issue. Voters will decide Nov. 6 on the truth of that statement.